We all a huge debt of thanks to our military - to those that have served voluntary to protect our country and our freedoms. Carrying a good tactical knife is essential for your daily survival whether you're a firefighter, police officer, or active military. Even when you're off duty, you can still keep this tough tool and tactical weapon handy. An ambidextrous thumb stud and stainless steel blade can a lot mean when someone's tangled by their seatbelt and trapped in a crashed car. By ensuring that you have a reliable tool handy, you will always be prepared for the unpredictable. Being prepared for the unexpected is what toting a Sarge knife is about. You don't know when the multi-tool you are carrying may be exactly what you need to get out of a tough situation. Stay prepared for any situation that you might encounter. No matter where he is serving, this Zippo lighter will be his prized possession. This brushed chrome Zippo has the Navy's Anchor Emblem in gold on the bottom front. 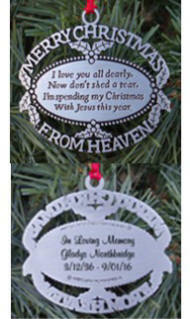 It can be engraved with personalization of your choice such as a name or military title on the front top lid and also on the bottom back. 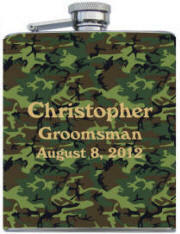 This full color camo printed 8 oz stainless steel flasks can be printed with any lettering. We custom print on durable vinyl with a laminate protection making a full color durable flask that will last for many years.